Raw corn is something to be celebrated. I can’t count the times that people wrinkled up their nose at me and said, “You eat corn raw?! Isn’t it hard to chew?” Nope. It’s super soft, and it’s sugary sweet due to the fact that it has yet to be cooked. It’s during the cooking process that the sugars are converted to starch. In the summer, and any time a recipe calls for boiled/steamed corn or even a bag of frozen corn, I usually use raw corn instead because it’s so delicious. We were at the store picking up taco ingredients for dinner one night, and my partner had also picked up some of the fresh corn that’s begun to flood the markets. 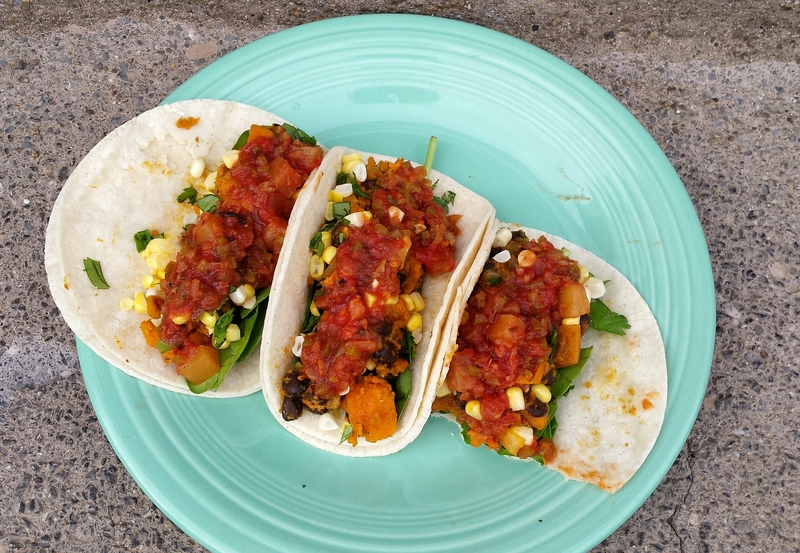 He mentioned having it with dinner, and after convincing him that raw corn kernels would be great on tacos (there was a quick taste test involved), I made these fiesta-worthy tacos. -Wash, cube, and steam the sweet potatoes in a steamer or a covered pan with a bit of water. -Destem and chop a 1/4 cup of cilantro and set aside. -Shuck 1 corn cob and slice off the kernels. Either 1) place flat on a cutting board and run the knife down the side of the cob. Rotate and repeat until you get all the way around, or 2) stand it with the point end straight up and cut down the cob. Rotate until you get all the way around. You may wish to place the cob in a bowl with this method as it can get messy. -Meanwhile heat a skillet with a drizzle of oil on medium heat. Add the onions and saute until they become translucent. Then add the garlic and saute for 1-2 more minutes, stirring once or twice. -Add black beans and spices into the skillet and stir. Let it cook for several minutes. If the sweet potatoes haven’t finished by this point, turn the burner off and cover the pan. -When the sweet potatoes have finished, drain any water from them if need be, then add them to the skillet. Mash them slightly and cook them just long enough to get some color on them. 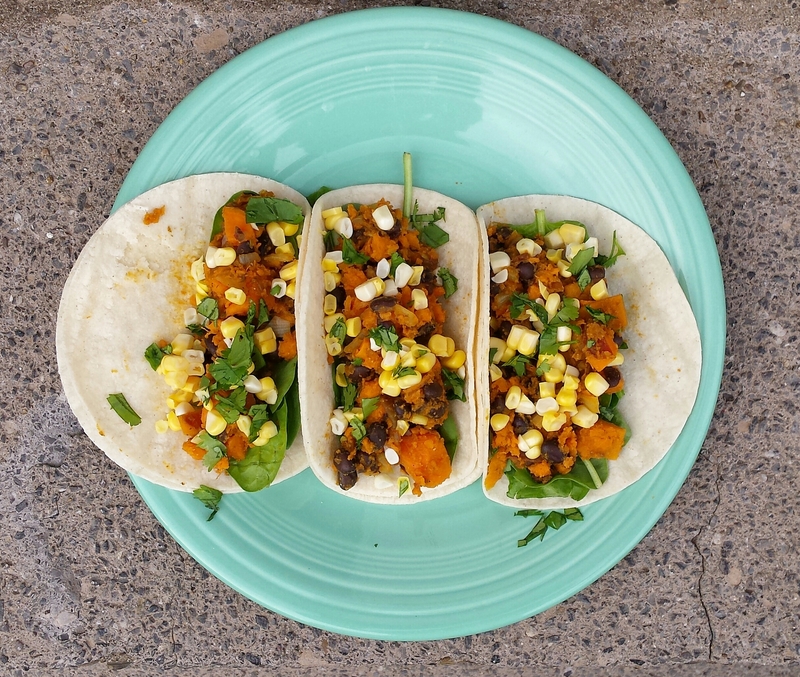 -Warm the corn tortillas and then place in filling and top with the raw corn, cilantro, and salsa.